"Rise of the Hollow Men" - Conclusion: "The Neverending..."
Tannarak laughs at his two captives. Superboy gasping for air and Phantom Stranger struggling with his magical bonds watch helplessly as Lori and Simon try to fight off Parasite and the Hollow Men. The Parasite frogs have no effect on their genetic father and Parasite promptly pins Simon to the side of the barn they are trapped in. Lori dons Simon's 'War Helmet' and uses it to stun Rudy into a pen full of Hollow Hounds who proceed to eat him alive. Now they have the army of Hollow Men pounding at the door to deal with, but the War Helmet is out of power and all they have is a small smartphone to defend themselves. Tannarak is still gloating that he is close to creating a Kryptonian/human/magic hybrid army of Hollow Men once he implants the souls of Smallville into them. Phantom Stranger reveals he is not as helpless as his captor thought. Though trapped, he had been releasing slivers of his energy into a proxy body that had been helping Conner. Superboy realized he means the small figurines he had been given and, fighting against the strangulation spell, he is able to reach for one of the figurines holding Phantom Stranger's power. Suddenly the tide is turned and Phantom Stranger is free. With Sujan knocked out, Simon theorizes that with his cellphone he can shut down the control matrix that is giving these clay men life. At that same moment Superboy takes down Eben Took and his sons as Krypto flies up and rips the orb that powered Tannarak's cloning machine. The clones begin to explode as Conner and Krypto smash more of Tannarak's base and over in the barn, Lori hits the cellphone's kill switch and the just like the clones and the Hollow Men begin to self destruct. With good timing, Sujan wakes and the team reunites to put an end to the fight. Psionic Lad uses all his powers, additionally boosted by the magic of Phantom Stranger, to send the souls of Smallville back to their bodies. Tannarak refuses to be beaten and reclaims the Took family immortality enabling him to escape. The team, under a spell from Stranger, make good their escape as the Hollow Men base implodes. Phantom Stranger vows to chase down Tannarak and leaves the friends to ponder the events. Sujan has abandoned his mission to kill Simon instead hoping his presence in the present has changed things. Lori has resigned herself to friends and confidence. Krypto is happy to be with Conner, and the Boy of Steel? Story - 5: A good send off. I won't go on and on about how it's been rushed to an end as I've already touched upon that. 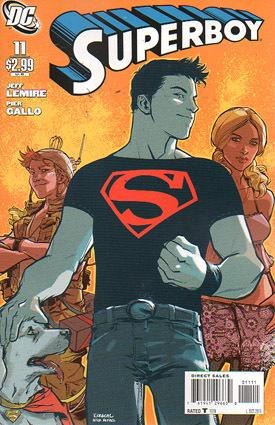 What we have here is a good solid Superboy story and a new solid supporting cast. I'm sad the plot with Sujan was brushed off, Simon Valentine becoming Prime forgotten and Lori's love for her own half brother quietly avoided but they had to get the Hollow Men story to its end. Surprisingly all the longterm threads were neatly dealt with and we were left with a much better finale than that awarded in "Grounded". If you missed this 11 issue run see if your store has them in back issues. This is well worth a read. A superb title cut off prematurely. Art - 5: The artwork is stunning, just the right mix of action and drama swirled together by the expert hand of Gallo. I wish this was a double sized finale as I would have loved to have seen more of the art. I will definitely follow both Lemire and Gallo in their future projects and recommend you do too. Cover Art - 5: It may be a Rob Granito style cover but gee it's a good homage to the first issue and completes the circle. It's a bittersweet goodbye to a brilliant book.